Strange asked her veterinarian for a referral and was directed to Shellie Skopit, who has training in animal acupuncture. Skopit and her husband, Damian Battersby, recently purchased Park Animal Hospital with locations in Darien and Norwalk. The practice of acupuncture dates back 2,000 years, though some suggest that it goes farther than that. The first known text that references acupuncture techniques is "The Yellow Emperor's Classic of Internal Medicine," which dates back to 100 BCE. During the Ming Dynasty in China (1368-1644) the Great Compendium of Acupuncture and Moxibustion was published and laid the ground work for the basis of modern acupuncture. The text maps the original 365 acupuncture points on the body. Since then, more have been added. During the 1950s, acupuncture research institutes were established in China. Acupuncture made its way to the United States in the 1970s when James Reston, a member of the press corps during President Richard Nixon's visit to China, needed an emergency appendectomy. Doctors treated Reston's post-surgical pain with acupuncture, which prompted him to write the article "Now, about my operation in Peking." The article sparked the interest of American doctors who would go on fact-finding trips to China to learn more about the medical benefits of acupuncture. In 1982, the Accreditation Commission for Acupuncture and Oriental Medicine and the Council of Colleges of Acupuncture and Oriental Medicine were founded. Since then, more than 50 acupuncture schools have been created in the United States. The only acupuncture program in Connecticut is at the University of Bridgeport. Dudley's weekly house calls continued until he died at age 15. "There were times that either Shellie or I couldn't do it and so we skipped a week and I noticed a difference," Strange said. Acupuncture has been practiced for centuries and when first developed it was used on people, Skopit said. It was then practiced on farm animals that were going into labor. After Skopit graduated from veterinary school 10 years ago, she started work in a small animal hospital where integrative medicine -- Western and holistic -- was being practiced. "I just found it really interesting that you take a problem -- such as chronic problems like arthritis or irritable bowel syndrome -- and you see these animals who have had these problems for years," Skopit said. "Traditional medicine may work, but there's not really a cure, so you're using your traditional medicines to manage the problems but because it's a chronic problem, the animals are tired and crotchety so we bring something else in to rejuvenate them and increase their spirit and increase quality of life. I think it's great to combine something to make the animal feel better." The acupuncture helps stimulate blood flow and release hormones depending on where the needle is placed, Skopit said. Often times, it is used on large dogs who have joint and arthritis problems, but she has also seen it used on dogs such as dachshunds and corgis who have long bodies and short legs, which can lead to back pain and slipped disks. Skopit said she doesn't push the acupuncture option on pet owners but has found that many of them who have had it done on their animals also used acupuncture on themselves. "There's never a wrong choice, we're all trying to do what's right for our animal," Skopit said. "It's just coming up with the right plan for the right animal. And for some animals, they may be too stressed to come in here and they're not going to handle those needles and I don't want to stress those animals out more, so something like the therapeutic laser, where you're not poking them but hovering a laser above them is the better choice." The therapeutic laser, which the couple is looking to purchase, can be used as an alternative therapy to target trouble areas in animals. While one may think a pet would not like to have needles inserted into its body, Skopit disagreed. Many of the dogs are calm, she said, and the first area at which she inserts a needle is at the top of the animal's head, where there is a calming point. Strange suggests that Skopit also helps calm the dogs. "Shellie is a calm soul herself so that brings a sense of calm to the dog, too," Strange said. 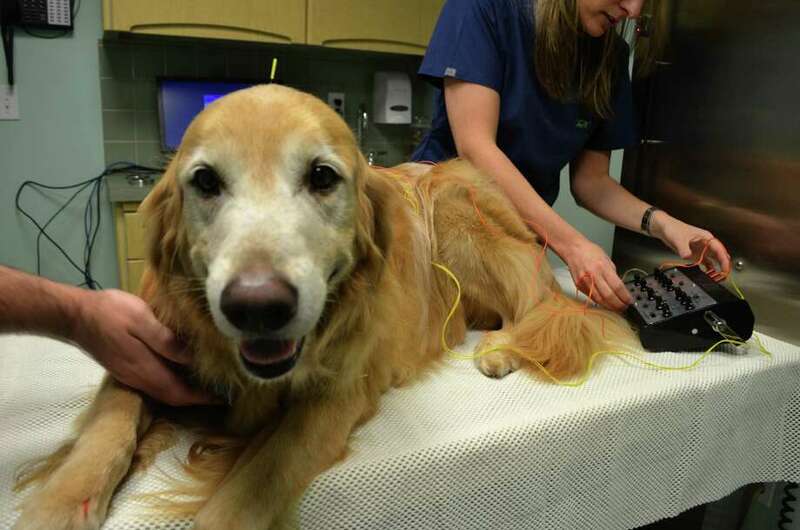 In one of the exam rooms at Park Avenue Animal Hospital in Darien, Skopit demonstrated how the acupuncture worked on her 11-year-old golden retriever, Beamer, who in the last several months started showing signs of joint pain. Beamer was enthusiastic in the room, running back and forth from Skopit to Battersby, but when he got on the exam table, he lay down and relaxed as Skopit inserted the first needle into his head. The needles, which are much smaller than needles used for injections, just go far enough to penetrate the deep muscle and rarely draw any blood. The needles are placed in areas of the body where there are blood vessels and key nerves. "By placing the needles there, the body releases a lot of its natural chemicals like serotonin and endorphins, and those are our basic pain relievers, our feel-good chemicals," Skopit said. "By stimulating those areas, the body releases the chemicals and it starts to relax the animal and you start to release those chemicals so the animal starts feeling better and reducing pain." After all the needles were inserted, Beamer patiently sat on the exam table, with what looked like a smile on his face. Skopit used electrotherapy as well, hooking up wires that deliver small shots of electricity to the needles in Beamer's back to further stimulate the blood flow in the area. Within 15 minutes, Beamer's needles are removed and discarded. Skopit said she has seen an increase in owners interested in trying acupuncture for their animals. "I think people have become more open over the last several years, and the more people seek alternative treatments for themselves, they start seeking it for their animals," Skopit said. Many of the people who ask about the acupuncture, Battersby said, are people who have older dogs with back or arthritis problems, where surgery isn't an option. "Acupuncture is not invasive. We're not going to hurt anything," Battersby said. Skopit said she doesn't usually recommend a pet owner only use acupuncture. "You want to use the acupuncture to help with the pain while you're still using the traditional pain medication," Skopit said. "But you want to get the benefit of both." Battersby added that with a chronic condition, a multimodal treatment is preferred. "We're not just using one thing to treat it, we're using a variety of methods to treat it," Battersby said. "There's not one magic thing that works." Strange said when her 12-year-old border collie, Nell, starting showing the same joint issues as Dudley, she called Skopit for an acupuncture session. "Nell does little tune-ups every now and again," Strange said. "Whenever I see her struggling to get up, it's always an indication that she has the weakness in her spine or hips. You try everything you possible can. I bought the (non-slip) socks. It's just better if their body feels better. It's tough to watch them struggle."